This time of year is supposed to be a happy time, and for many of us it is, BUT for many of us it is not. Today I am going to tell you a bit about one of our local radio stations, at this time of the year they have the Christmas Wish, basically what this is, is people will send in wishes for someone they think needs a little or a lot of help, the radio station then gets companies involved to sponsor what the people need. It’s been on since Monday, today’s one however touched me more than the others. It was about a lady by the name of Susan, who struggles to make ends meet, she and her husband sleep on the floor and her 2 children do not have their own beds. The wish that her friend sent through was that her friends 2 children could each have their own single bed. Well they got that, each child got a bed of their own but Susan and her husband also got a bed, as well as a R10 000 pick n pay voucher for Groceries. Well to most this might be a small request, but if you think of it, this is a very big one. I whine and moan about my situation, and how bad things are for me, how it’s always a struggle from pay day to pay day, and I am sure there are lots of people out there that are like me but then you hear other peoples stories like this one, they don’t have beds to sleep on, I have a bed to sleep on. I take that for granted, how many of you can say that you do not take that for granted, how many of you can say that you do not have a bed to sleep on? Something that seems so small and unimportant to us seems to be big and important to other people. So this got me thinking, and I hope it gets you thinking too. Be grateful for what you have, yes we might not earn as much money as the person that sits next to you in your office, or the director of the company, yes you might struggle to make ends meet, you might not be able to spoil yourself every now and then. You feel like it’s a constant battle just to survive, I know sometimes (many times) that is how I have felt, but I am RICH, you are RICH, WE ARE RICH, think about it if you have a bed to sleep on, a roof over your head, food on your table at night …. 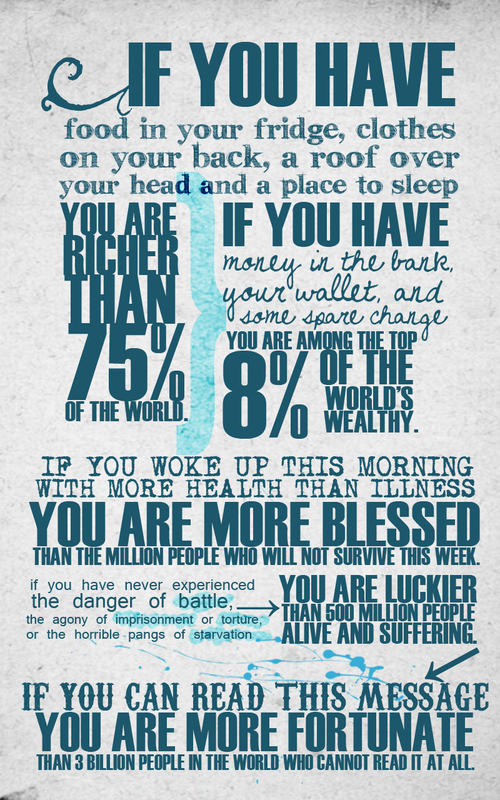 YOU ARE RICH, there are so many other people out there that have so little, they don’t have things that we have and that we take for granted. I cried this morning when I heard their story, to think I have something they don’t and I think I have the right to complain. So the next time I start to complain, I hope and pray that I am reminded that I have so much more than many others, and need to be grateful for what I do have. BECAUSE I AM RICH. So this festive season I am going to try and find someone who is less fortunate than me and I am going to do something (don’t know what) but something to make their lives a little more pleasant this Christmas, maybe it will make me feel better about my situation to put a smile on someone else’s face, and ease the pressure for someone else. What are you going to do? Come on I challenge you go out and find someone less fortunate than yourself and try to make their lives a little easier. I can guarantee you it will make you feel better about yourself. Posted on November 23, 2011 November 23, 2011 Tags Bible Verses, Christianity, Christmas, Christmas Spirit, Fortunate, Giving, God, Jesus, love, StruggleLeave a comment on Its Christmas time! !